The Sunday Times today posted a rather distressing story of how a family tragically come into contact with nearly $1 million and lost it in 2 years. I felt that there are a few things that we can pick out from this. In March 17 2012, cleaning supervisor Chandra, 34 was killed at Changi Terminal by a taxi hijacked by a chinese national. 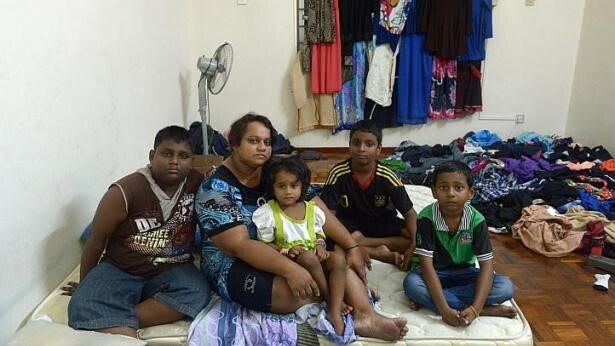 The Chinese national is serving a two year sentence and Chandra left behind Madam Pusparani Mohan, 34, his wife and 4 children (2,7,10,11 years old now). Both of them came from Malaysia to work at Changi Airport Group (CAG), making a total of SG$ 2000 per month. Donations poured in from the public, sympathizing with her needing to bring up 4 kids. CAG helped with the collection, which came up to $800k. There was an addition of $100k in insurance payout. This totals about $950k ( based on what was revealed later). CAG set them up with counsellors and financial services advisors, who help advice her with a financial plan for the long term. The advisor proposed not to touch majority of the money, meant for her children in the future. This include setting aside $200k each of the 4 children, including an annuity plan. This will leave her with $150k that she may be able to go back to Malaysia and set up some small business. She was then told the $100k was only enough to purchase 1 lorry and they needed 3 more. So she withdrew $400k of her children’s $800k to buy 2 more lorries. The business made money in the first 3 months, but started to lose money in the 4th month. She never gambled or have a problem lifestyle, as her younger brother claims. She took the rest of the $400k of the money meant for her children to feed the family, as she isn’t working. This $400k lasted her 5 months. She said her expenses came up to RM$5-6k. She is effectively broke by now. Her friend set her up with a job as an accounts clerk earning RM$2k (SG$780) per month. Her employer paid for the rent for an old double story bungalow where they live now. They do not have much money for daily necessities. She is thinking of gong to Singapore to work. For the everyday folks, you can sometimes understand a bit why a $500k lottery win, will in a few years felt like you didn’t enjoy it. We don’t quite understand what we are buying is true happiness, and thus save up very little happy memories. Figuring out these questions will help you better plan and make use of your windfall, preserve the windfall over time as well. A good way to frame whether you are ready for managing money is, if your boss ties you and your wife to a 10 year long term contract, gives you all your 12-14 month salary 10 years in advance, and not pay you next time, how would your perspective of your income and what you do with it change? “The CAG financial adviser advised me to divide the money between myself and my four children. After allocating $200,000 to each of my four children, I was left with $150,000,” she said. Kudos to Changi Airport Group (CAG) to link her up with counsellor and financial services consultant on how to use this amount of money in the near term and future. And she did put what was advice into action. When you come into a large sum of money, it overwhelms you and you are at a lost how you should use this. Having someone who has plan large sum of money advising you helps. Unfortunately, you have to buy into it as well. In life, sometimes you see your subordinates nodding their head but you wonder if they understand what is required. Active listening is a rare trait. 1 month out of counselling and you don’t remember what was said to you anymore. The advisors probably have told her some really good advice. However, I wonder how much she has picked up. If she did, perhaps this is the first time she is hearing it. There are much personal finance disciplines that you do not need a degree to know. They usually come from hearsay, or from elders. In this case, could Madam Pusparani have more restraint by taking a more decisive view on her children’s money? Had she maintained that, perhaps she would have thought about looking for a job before touching ALL the money meant for the children. I somehow detect that Madam Pusparani, was not able to gauge the level of risk she is subjecting to. Business ventures can be very rewarding, but are prone to big failures as well. Many look at the work, and the upside, but seldom evaluate can they live with losing that money all together. Perhaps the annuity, is already a rather good investment for the future already. Madam Pusparani mentions that when people know she have this amount of money, all her friends or family want a piece of her. And it is true. The relatives whom I know that have been in the same situation said this. You also get more financial advisors and friends wanting to start businesses circulating around when you have a windfall. Are they true friends, probably harder to tell compare to when you have no money and you need help. I must confess that I am not an expert with prices in Malaysia, so I have to look up the second hand market. The lorries cost around RM$40-50k for a reasonable size one, RM$70k for a rather large one, RM$100k for those that towed things. That is correspondingly SG$15-19k, SG$27k and SG$39k. I have a feeling that either much of the money for business went to other areas, or that those are really special lorries. The worry here is that, whether the money Madam Pusparani put in, is put to good use. Madam Pusparani claims that her expenses came up to that amount. That is roughly equivalent to SG$1.95k. I find it perplexing if we are talking about basic sustenance. If i struggle in Singapore, I can probably make use of SG$2k. Was it due to the 4 children that requires so much? Either way, the cost of living from what I understand is lower in Malaysia, you should not need that much. This means that there may be much lifestyle leakage somewhere. Its a challenging situation, considering even middle managers in Singapore have a hard time with lifestyle leakage, constantly asking themselves where have all my money gone to. Life has a way of building up, crashing down then building up again. Perhaps that is why there are folks preferring things to be simple, not having to worry about a “good situation” like this. I wonder if the family see the whole situation and wish it will turn out otherwise. I think most of us agree that accident shouldn’t happen in the first place. As I read, I somehow distil that, to be successful in any discipline, be it money or life, you need 4 things: Decisiveness and Determination, Habits & System, Knowledge, Environment. Does this situation frame it accordingly? In a gauge of 4 to –4, –1.5 leans towards much problems that hinders the family from being more successful. You can’t be successful just by knowing and not implementing, or in this case what you do is completely different from what was advice. Sometimes you need some steadfastness in decision you make. It helps massively that you have a rather positive environment. Want to learn more about Wealth Building? Check out my FREE resources here including my FREE Stock Portfolio Tracking Spreadsheet. I’ve just read the article on the Straits Times, and can’t help but feel exasperated. Her apparent inability to account for the remaining S$400k spent over the last four to five months is just perplexing – I highly doubt her brother’s claim that she didn’t/doesn’t gamble. Most of such windfall-gone-with-the-wind cases that I know of personally, involve gambling loss, explained with a flurry of ‘I-don’t-knows’ until the individual eventually relents and admits. The brother who got her to ‘invest’ half of the money into the supposed transport business was almost certainly pulling a fast one on her. Their falling out aside, even if four lorries were really purchased, they are brand-new assets that even with depreciation, couldn’t have simply disappeared and zero out in value. She claims that as a result of the falling out, she is unable to do anything about the money she threw in. No further comment. Like past charity fund mismanagement cases, this will only serve to destroy public goodwill that has always accompanied response to such tragic incidents. What a shame. There is a saying that easy come easy goes. But i think too bad, you either have a “business mind” or you don’t. thanks for thinking out loud and providing your point of view. its unfair that we judge too much here (guilty as charge on my part) but there are definitely a lot of unexplain stuff. The figure obviously do not tally. S$400k is at least RM800k. Even if they spend RM6k per month, it should last her at least 11years. Seriously, Malaysia bank’s FD rate is about at least 3%. Assume exchange rate of 2, SGD800k is at least equivalent to RM1.6m. With 3% interest rate, the interest is at least RM4k monthly, which I believe is sufficient for a prudent fa,ily of 5 in Malaysia. The Sunday Times is subtly hinting that a fool and his money is soon parted, so it is better to have the CPF keep it for you. I believe a bigger fool is one who collect 2.5% participating in a forced Ponzi where the money is already departed before he ever lay his hands on. Hi saycheese, it might be a subtle nudge, but it’s not a force ponzi scheme in that it’s like all pension system where you work for the greater good that not everyone can be Smartt with their money. Our ponzi scheme gives you the option of investing at a greater return that many are taking advantage of.